A paracord net can be used for a number of different purposes. It is easy to make although it does take time, depending on what you are intending to use if for. This type of netting has a lot of potential uses. Dragging it through a shallow portion of water to catch fish, using it to store food to hang to keep bears from getting to it to hauling firewood or anything else that fits into it, what you can use it for depends on the time and materials you have to invest. 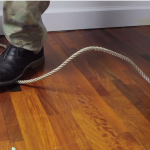 How would you use a paracord net? Tell us below.